In cement plant, Vertical Grinding Mill is very important since most of the raw materials will have to be crushed before being used to process cement, such as limestone, clay, iron ore and coal, etc. Limestone is the largest amount of raw material during cement production. Limestone is generally of large size and high hardness. 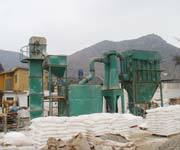 Therefore the limestone mill is very important in the whole cement plant. Cement vertical mill is the main and new process equipment in the cement grinding plant. LM series cement vertical mill is one of strong and high grinding efficiency and good operational stability. To some extent, reducing the power consumption or increasing the system output has solved concerns of low production of cement, running instability, etc. By replacing cement ball mill with cement vertical mill, we can realize the role of reducing energy consumption. Relatively speaking, using cement vertical mill to grind cement raw material, coal and blast furnace slag has been fine for the mature technology. As long as we control the cement particle size distribution, water demand, the types of ingredients in the gypsum and grinding temperature and so on, to achieve large-scale promotion of the cement vertical mill use is very promising. Flow of material through the Vertical roller mill of the separator when, the motor will drive the plate to rotate by the reducer and then the materials will fall down on the central place of the plate from the inlet by the qir-locking feeder .While at the same time ,the hot air will enter the grinder from the air inlet. With the rotation of the plate, the materials will move to the edge of the plate by the centrifugal force and the materials will received the pressure from the roller and be crushed when it passes the circle ring sink on the plate..And the coarse powder will fall down from the cone hopper and then repeat this kind of process when materials in the air stream passes, the upper separator by the effect of the rotors. And during the process ,the fine powder will flow out with the air stream .By the dust catcher ,the final products will be collected .The materials with moisture will be dry when it contact with the hot air stream. By adjusting the temperature of the hot air, we can satisfy materials with various moisture degrees, thus achieving the required products moisture. By the separator, we can also achieve the required coarse and fine degree of the products.